At Exotic Pebbles and Glass we’re big on Eco Friendly products! This week I’m going green I’ll tell you why eco glass is more environmentally friendly than organic mulch and give you the ultimate run down on sustainable landscaping. Why you should get rid of your patio and replace it with a tree. And when you should spend money on new ecologically sustainable landscaping and when you can just improvise a better solution by yourself. After my post about 2017 design directions, some people were caught by surprise, by the ecological direction. Aesthetic took a back seat, and now design follows a new direction. Sustainable design is all well and good, but, homesteading? Synthetic turfs? That’s pushing it, to say the least. But in this post, I’ll go further and show you that good design isn’t necessarily design that sticks to the basics, but rather it’s the application of creativity to solve problems. Beyond the regular eco-warrior tips and some basic principles, I’m going to reimagine the modern yard. A blend of organic and synthetic fused together to both please and protect. There’s only so many ways you can make a lawn look fresh and exciting. But an above ground aquarium? A flowerbed filled with exotic weeds. Now, we’re playing with some new elements, and I see no reason why we should cower away and not use these new features, even if we don’t get 100% sustainability, it’s still going to be an improvement, and we got to play with some new design elements in the process. The basic principles of sustainability are minimizing resource needs and making the best out of the waste and byproducts of your garden. First, let’s consider what we input into our landscaping, first of all, materials. We try to use biodegradable elements, like wood, mulch, paper or cardboard or permanent materials that don’t degrade but also don’t pollute because they have a very long lifespan and when we do throw them away and recycle the raw matter: nonreactive plastic, corrugated metal, fireglass. We’re going with the first ones usually when their production doesn’t actually create any environmental externalities, let’s say a homestead in the woods. Even a village can not consume enough wood to endanger the forest unless it’s a logging community and the cut-down wood for the entire Pacific Nord West. This is why I prefer the later. And I think modern manufacturing, with products that degrade in less than a year, is more harmful than 6 decades ago when you basically had bought everything you would even own by the age of 24. Here’s where it gets controversial. Eco Glass or landscaping glass is this type of perennial material. There is an argument that can be made for mulch as a land cover. It locks in humidity, it protects the top layer of soil from direct sun, and it decomposes releasing nutrients over time into the ground. It’s an excellent choice, but considering you need to replace it seasonally, I don’t think it’s a sustainable option in the global sense. All those bags of mulch need to be produced, processed, wrapped and transported in a neverending cycle. Sure, even if you produce biomass with it, and the only waste is the plastic bags it comes it still produces more waste byproducts than the equivalent of landscaping glass or better said eco glass. And don’t get me started on its looks, it makes gravel look appealing. Check out our guide on backyard landscapes here! Another input consideration is water and fertilizer. Water is a significant’ issue, and I will be addressing it all across this post. It’s too important just to list out our abuse in use and how we waste it. For now, let’s talk fertilizer. Ideally, you want to try to get away with as little phosphorus, and nitrogen seeping into the ground or wash off getting in the sewers. Meter your ground, find out what it needs and give it just enough to not “burn it.” You can’t go in blindly, you need to know what is going on inside the ground. The second step, manage your plants carefully, pick hardy grasses and flowers and plants that don’t attract pests. To prevent further weed growth, install a permanent weed barrier made out of non-reactive plastic, or some more biodegradable weed barriers like cardboard. I prefer the biodegradable option here because it’s just more versatile. Easy to readjust and adapt if you get one or two weeds slipping trough. In regards to output, there is a lot to be said, from water run off to grass clipping getting brushed off and going in the sewer. One of the biggest wastes is done during maintenance, and that’s also when you wash away all the nutrients and fertilizer and let it drain into our water system. You need those clippings, and by letting them wash away, you are ironically also paying for the city to clean them up. Goes without saying that if you can, compost. Even if you don’t want to go all out on creating a zero carbon footprint, you should really consider just how nurturing compost is for your soil and just how well plants thrive in composted soil, especially if it’s dense and compact clay soil. And you don’t actually have to do it yourself. Go online and have a look around for communal composting around your area. And hand them the clippings instead of just throwing them away, who knows, maybe you’ll get some composting tips in the process. If you want to go the extra mile or to the last, level in reducing waste is setting your greens in aquaponic gardens. Zero waste, zero maintenance. A full-scale carbon and lifecycle right in your garden. And it actually gives you food if you set it up that way. If you have space for a pond and a plant bed, actually consider this more expensive garden. It will surely be the most eye-catching feature in your garden even if you leave it to the side and don’t really make a big deal out of it. That’s the power of selfaware design, it speaks of human values and engages even when it is understated and restrained. It’s just fascinating that we can create a complete, self-sufficient system within a couple of square feet. And we can do even more than that if you take a look at the permaculture craze. Now we’re getting into the meat of this. This is all about reducing waste and getting the longest life span out of your materials. A proper garden should require some work to set up but then require minimal input or expenses over its and your lifetime. The first point I want to hammer home is that the eye doesn’t see age or price. You see texture, color, shape, lines and elements. And for a couple of hundred years now we’ve had some fantastic materials that with fantastic shapes that can outlive us. So if you have a prejudice against anything that isn’t new, stop it. You are turning away from a Mona Lisa for a selfie. Old school manufacturing was a craft that took you years to master, now that same level of expertise and value is almost gone unless we are talking about really expensive custom pieces. And even then, I would choose the older piece because I’ve met some modern “craftsman, ” and they are younger than me. Don’t be scared of scouting around for old pieces or even damaged or rusty pieces. Scout around for some interesting pieces made out of recycled materials, I’ve seen this done with corrugated galvanized steel, terra cotta pots, and bricks. If you put in some work in even damaged or degraded assets can be made to shine again, literally. Broken slabs of concrete can be sanded down, stained and used as walls, backgrounds, stairs or platforms. Use a slight stain and just add some character to it making it older, so it preserves its recycled origins. If I had the time, I would never buy a terracotta pot or a forged steel support ever again. There are tons of beautiful designs online that outshine any expensive modern option. 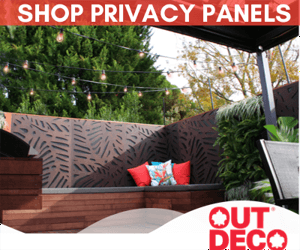 Get a privacy panel from our store over here, and you’ve got this very classic unique green vertical element that adds a character in any yard with a minimal footprint, both regarding space and regarding carbon. In the the same way, you can use corrugated steel for any installations that require a sturdy material but be lighter than rock or stone. Get any construction throwaways, and with a polish, it’s brand new. This is especially handy as smaller pieces are harder to get your hands on without scrounging around. I don’t know why you would use anything else for a roof to your patio or shed. Always be careful when working with acid, always use protection a respirator and be aware of your wind direction or go to a professional and let them do it, support local craftsmanship whenever you get the chance, the have the tools, the skill, and the materials to give you the best results. Another waste is water evaporation. Ideally, for water retention, you should use a wood mulch, but I made my argument why that isn’t actually environmentally aware, it also encourages weed growth, and we already want to reduce the chemicals we input into our soil. So I go unapologetically with rocks or glass. Because we are talking about the smallest environmental impact, landscaping glass is the clear winner, within this context all Landscaping glass is eco glass. It’s recycled tempered glass and has no decay over the years. If anything you can just throw it in a tumbler with some carbide grit, ceramic pellets, and some water and tumble it for a couple of days and you get shiny new gems. No other ground cover can over so much for such a small carbon footprint. And regarding water retention, we’ll talk more about that in the next part, but suffice to say that smarter irrigation and more intelligent selection of plants work better than using wood mulch as a universal fix. Plant trees, use shading panels, loosen the ground, so it absorbs more water and stores it deeper like in a rain garden, use a continuous automated sprinkler system in combination with. There are so many options that are much better than just storing the moisture with mulch. Now, you wouldn’t argue that burning fossil fuels are in any way sustainable. But if you really want that fire feature gas burners are so much cleaner than wood. Wood releases 3000 times more particulates in the air compared to natural gas. Also, if you use a fire glass bed for the flame, you can accentuate the flicker and get away with a much smaller flame compared to the size of the wood fire you need to get the same effect. The Same thing applies if you have an aging fireplace and you want something new, go directly to gas, it’s cleaner, and it looks better if you learn how to use, by reading this article, over here from my fire glass design guide. Check out our guide on Outdoor Fire Place Design for more inspiration. Invasive plants are another environmental pollutant that up until recently we rarely considered. Because plants like the purple loosestrife have had a devastating effect on biodiversity in North America and New Zealand eradicating whole fields of local flora because of it’s more aggressive growth cycle, it matures and monopolizes the resources of other plants and clears out the native competition. These plants are like weeds on steroids. This is more than just another argument for nativars. I want you to really look closely at the effects your plants can produce and how connected your garden is with the larger environment. We often just draw inspiration and falsely believe that our yard and the rest of the world are separate entities and the causality is exclusively one-sided. It’s not, and you should be more aware of that, especially if you live within miles of concrete and asphalt, which may seem like a world away from the forests of Cascadia or the Ogalla aquifer. One final note on waste and this is more of a metaphorical one. Don’t waste your space and native topography. Take advantage of dark corners, hills, and “10 hours of sunlight” areas. You can get a lot of variation if you use the environment and work with it instead of investing money to change it and adapt to the plants you want to use. And this brings up the subject of nativars. Local plants will always thrive where you need a lot of effort and expense to make others work. If you don’t have much space; read out maximizing small backyard designs here. Just by checking your soil and shopping around for climate specific plants you’re gonna have a better-looking garden, cheaper and without the need to use any expensive toxic chemicals. We’ll get to how actually to change the landscape in the next part, but for now, I want to address people that aren’t remodeling or have a lot of space. Use hills for greedy flowers than need a lot of air and sun. Use natural shade or a privacy panel shade for short brushes that want more humidity. You can get a lot of environments from a small garden if you try. This is what landscaping is all about, with enough money and tech we can build a Amazonian rainforest on Mars, but that’s just lazy. Now, I’m gonna teach you how to make the most of what you have available. The most obvious option and the easiest for those with small budgets are to collect rainwater runoff in rain barrels and just use the free soft water for your gardens needs. Besides the ecological benefits, this option is very versatile for use in small spaces and the Chinese are experimenting with the technology as a linchpin in combination with solar panels for indoor heating. Speaking of small spaces, downsize your lawn area. This is a forced design choice in many gardens built after 2014 when we all became very aware of the effects of climate change. Now, it’s not seen as a design compromise but rather a creative opportunity for zoning and segmentation, which means that in regards to lawns large yards and small gardens have an equal chance at bold, unusual design. Flowerbeds are thirsty; use them as primary assets if you must have so you get most out of the water you have to use. Group them together based on their water and sun requirements. And funnel rain runoff into the thirstiest flower bed. Let it collect there and seep into the ground. If it doesn’t loosen the ground. 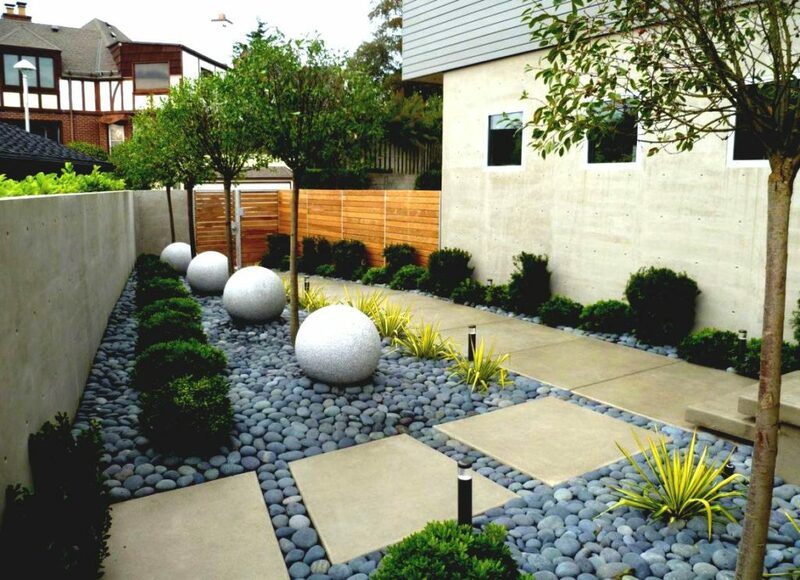 You can use landscaping rocks to help add to the design and look of your yard! This is a rain garden, and it uses depth of the soil as a natural reservoir for moisture that feeds of naturally from rainfall and any other water you might be using. It’s a bit tricky, and you need to adjust the water funneling a few times, but it’s amazing and invigorates your garden from beneath. Essentially they are a plant bed that is designed to collect runoff and stops it from getting into the sewers to prevent swelling during rainy seasons. They also have an excellent side effect on your soil, because a rain garden is made of loose soil and encourages pudling and infiltration the water seeps into the ground actually sponging up all the water during rainfall and very slowly releasing it during the drier season. It’s a great way to keep your soil healthy and to stabilize the stress densely populated areas put on the sewer system. Again, usually people cover it with mulch to keep the humidity at peak levels, but as I previously said, I prefer landscaping glass because it’s lower maintenance and discourages weed growth. And if you live in harder climates, the weeds will love that wet, fertile soil you have in that plant bed. IN the same way, but this time from the top down, use deciduous trees as natural shade and moisture catcher in the summer, for your more sensitive plants or to help with water evaporation. Trees are the reverse of lawns, the bigger, the deeper they go and the better balance of your soils humidity. They lose water very slowly and need proportionally less. A large tree will do more for the dry soil than any amount of wood mulch because it creates it’s very own microclimate balancing out wind, sun, and humidity. And just like the airing out of the solid you do with a rain garden, the roots of trees do than naturally. Trees also open up an interesting design opportunity, the livable recreational space. If you can afford a large three in you garden jump on it, it offers a unique feel for your gathering area, and it also provides a yearly natural source of composting keeping the ground beautiful and healthy. Use permeable pavings so you make an excellent compromise between making the most of the natural water cycle, and making is accessible and usable to your soil. I know changing your gathering spot to something more long term isn’t an attractive prospect. Think about it this way: our resources are getting used up faster each year. And each year there’s more of us to share what we have. Sustainable landscaping isn’t a fad, it’s an integrated way we will think of about all future landscaping design, so why not just get a head start on everyone. By the time it will be the only affordable options due to watering restrictions you’ll have a lush 10-year old covering your garden with its dense canopy. On a similar vain, but at a smaller scale, you should strive to use privacy panels and living walls instead of solid blocks for your separation. They don’t store heat and dry out their corners leaving some more breathing room, I’ve already talked about how cheap they can get and how great they look, so I won’t repeat myself, but you should also be aware of their positive influence on the health of your terrain and surrounding landscaping. And we would not be talking about sustainable landscape redesign without talking about rain gardens. Because they can work with any water source and act as a battery for humidity making water usage more efficient, they are the cheap and easy solution for most landscapers on a budget. The combination of privacy panels, synthetic lawns and rain gardens, should work for most mid-size gardens and are flexible enough when used in conjunction with some beautiful landscaping glass or gravel to provide an infinite amount of looks and styles regardless of your local climate. Get a mock up of your space and try out some designs, section it, figure out a central feature area, a secondary feature and then plan out some beautiful lines in between, cut them off with the panels and create the illusion of multiple communicating spaces instead of one big one. Go as green as you want, but at least try, there are plenty of lazy man option out there that are installed and forget. You don’t need to change everything in your garden. Keep these principles in mind for when you need to change some old features in your garden. Or better, follow the recycle policy, salvage the old feature and see how you can repurpose the old feature or spin it into something new. I’ve seen privacy panels made out of benches and art features made out of concrete stairs. Nothing is lost, everything is transformed, the only question is what is it going to transform into? But that’s an option, on a much more serious note is our obsession with lawns. If you live in a drought area, downsizing your lawns and getting rid of lawns altogether is somewhat more urgent as you seem to get less and less rain with each passing year. Cut it in quarters, and turn 2 diagonal corners into gravel pit’s, you will transform the surface into something modern and daring, and you would have cut in half your water expenditure. Replacing the gasoline mowers with an electric or manual one is one of the simplest switches you can make. Now for me personally a rugged, sharp mower beats a battery one any and every time. I could rant about this for a whole post, and maybe someday I will. But in my view a push reel mower is always the better option: your grass will be healthier, it’s quiet, it’s easy to maintain and fiddle with. But can’t argue with tastes. Just remember always to gather your clippings. Also, while on the subject of mowing, another handy tip to keep the ground from drying up is to leave your grass a little longer over the summer. It helps a lot and a 3-inch grass all but stops direct sunlight to fall on the underbed and drying it up. So while technology is a downgrade regarding mowers or at best a sidegrade. A tool that does improve your landscaping massively are sprinklers and this time technology improves them massively. Modern day sprinkler systems, monitor your soil’s humidity in real time, you can set variable watering based on zones and soil. High tech sprinklers are by far the most efficient irrigation option you can install. Although a bit expensive it will more than pay for it’self in less than 2 years, or less if your utility bills are above the national average. While if you live in less dry places, you can make the leap to rain gardens and or collect rainwater into a reservoir as suitable alternatives, but in arid environments save up and get these things, because they make a significant dent in your monthly utility bill. Again, especially for those of you that live in dry areas, the second biggest saver will be Xeriscaping. Over the years slowly move on to drought tolerant plants, succulents and deciduous trees for their soil regulating nurturing and protection and limited water needs. When you replace the ground cover consider landscaping glass, synthetic turfs gravel or crushed brick, which goes with any arid theme. Just remember, to get a strong weed barrier as well as dry land weeds are particularly hardy. We want to use as little poisons as possible even in the dessert.Use dense rot-resistant wood for your finishings, and in no time you will have a well-kept garden, toxin free that will last decades in the dessert.Or go a bit further down the rabbit whole. Use weeds as a feature. They work really well in arid scapes, and if you use them with intent, they can pass for native plants. Composting and aquaponics are not for everyone. But in the case of composting, do share your biomass with someone if they have a compost heap and get your composting needs from them when the time comes. I have no place for composting, but I would never lay a flower bed without it, so I looked around, found a couple of guys within a 15-minute drive and I get my compost healthy and natural from them directly. And that’s also where I empty all my waste. Win-Win. Outdoor aquariums are an interesting feature brought by the use aquaponics. In similar vain, ponds are the new lungs for your garden, so it’s definitely something to consider if you want to try something new and daring that infuses your yard with life. And the last level of eco-landscaping would be the permaculture, which is the full-scale autonomous garden, but this is a full-time affair and requires a lot of space. The basic concept is to make your whole garden a self-sustainable microenvironment. And it is so fascinating I might make a whole post about it, about zones, edge effect, vertical layers and the inspiration that all that can create into landscaping design.